So one of the big frustrations with the head injury stuff was that video/computer games became something I simply could not do - I love my games - I am not really what would be called a "gamer" I suppose - I love what I love and that is sliding block puzzles like Tetris and junk jewels/candy crush and hexic, arcade type games like Peggle where you are basically playing electronic pin ball, puzzle solvers like Oh No More Lemmings and Worms, platform games like the old Mario Brothers, racers - either simple race tracks or as space ships dodging things and trying to beat others for time, simulation games like Vector Tower Defence and Lux. But though I loved things like Street Fighter I have always struggled with the more immersive shooters etc... so Call of Duty and even games like Portal - I simply always failed to be good at playing them - I do like watching others play them - but normally only the fist time round - for me they become a slightly interactive movie in real time. Without Halo and the like I would hesitate to say I was ever a "gamer" I do like games however of all types, including board and and card games so I would say I am a GAMER and bring it on anyone who disagrees! The absence of computer games was heart breaking I couldn't even do the Connect Adventure stuff which was such an amazing boon when we got the xbox 360. There were multiple reasons for this - I'd knocked my optics out during the head injury and have a blind spot in my left eye I have had to adapt too, brain processing power being limited meant a 10 min screen season left me drained and then the visuals and motion gave me motion sickness at best and increased my chances of seizures. Every now and then I would try again and found last year that I could get on with Peggle (the pinball game) and proceeded to work my through the challenges I had left uncompleted in all the variants I had on the xbox. Hexic I have to be careful with still but can play a little bit but the one I was missing - the one I write stories about, the one I knit and collect the toys of... the one that is a family obsession and the one the kids kept asking me to play with them was of course MINECRAFT. My original world Gia is very out dated and somethings in it are broken due to the updates and the lack of certain biomes. I had made another world which was and will be an adventure map with Jean when we were hopeful the head injury stuff wasn't going to go on and on but it took too much out of me - she is now fretting that no one plays the adventure maps anymore but we have been designing it off line (yes I have note pads of scared paper - bite me!) so one day in like a decades time I'm sure we will complete it! Back to the minecraft - there are lots of different minerals and animals - I've found Lammas and bunnies and so so many fish! There is also a whole host of new monsters or mobs for me to jump out of my skin and fret about! Alaric pointed out that I am the guy from I am Legend where the Drowned are concerned. These new water zombies are new to me and one of my little bothies/half way houses is right near a load including baby ones which sadly I took out. I do however now have a clam shell - none of us really know what to do with it as the kids play mainly in creative using it as kind of electronic lego and Alaric had gotten bored and wandered away from it a while ago but has been helping me, Jean, Mary and my Dad with our worlds over Christmas and is getting back into it. Aqua-Ma'am is all about the fish - plans include an enchanted ice palace, a sandcastle hyper beach (though may not have enough sand for this), a giant glass pyramid at the very centre of the map and floating aquaria spheres in the sky, along with a research centre and theme park and underwater observation domes and maybe a ship or two - this is glass heavy so we will have to see how far the resources stretch! 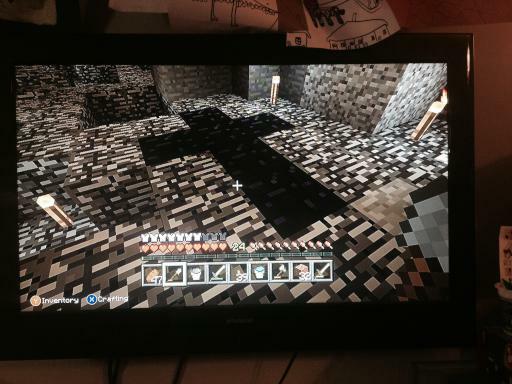 So far Dad has helped me mine resources so I had iron for shears so I could make beds without killing the sheep so that I could explore and uncover my map. Jean has chopped down trees and is my fount of minecraft knowledge, Mary has dropped me down holes in the ground and collected a load of snow balls for me and helped me tame my dog - currently called Dog. And Alric has been doing stints of exploring tunnels for me. I have built myself a series of little mud, stone and plank huts around my world, and started some basic farming. I uncovered the map - got lost a lot, am now not entirely sure where all the bothies are but have now found pumpkins so have grown them, carved them and produced jock-o-lanterns so that I can mark where the houses are better than my little torch trails. I am trying not to waste any resources - and spent far too much of last week playing! 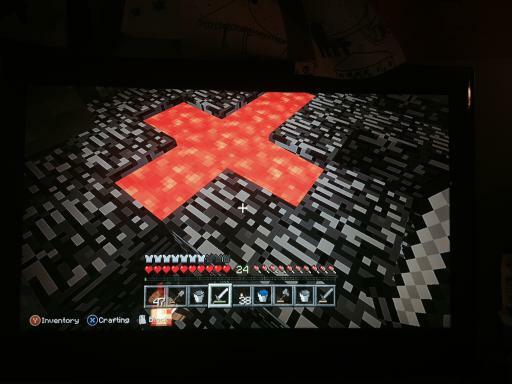 I decided to fill in the uneven bedrock floor with obsidian so had to retrieve lava in buckets - Al got the first lot for me and I accidentally destroyed a source block - boo hiss but once laid we build mud around and poured water on it. 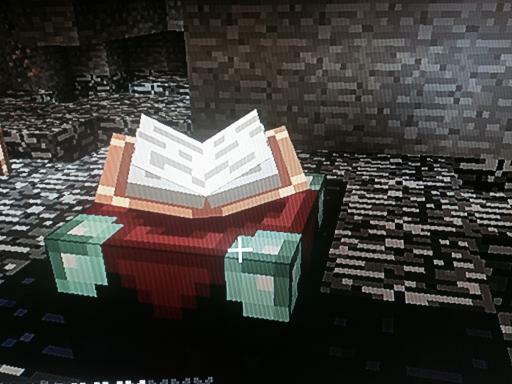 It had to all be lava source blocks as flowing lava becomes cobble stone. Really enjoying it and hoping I can remember what I am doing at the weekend when I get to play again!